Recently, I was contacted by the nice people who represent Alouette to ask if I’d like to review their products for the blog. Now that I can eat soft cheeses again (and I love brie), of course I said yes! The first product I tried was the Crème de Brie. I was intrigued because, like many of you--and you know you’re one of them--I’ve never really been sure what to do with the rind on brie. Eat it? Don’t eat it? Generally, it’s a game-day call for me. Is the rind delicate and taste okay? If so, I’ll eat it. If not, I leave it on the plate like the privileged first-worlder I am. The Crème de Brie solves this quandary! And the Crème de Brie is just as creamy as my favorite triple cream brie, St. Andre. The flavor is incredibly delicate. So delicate that you need to be careful what you pair it with. I’d suggest a slice of apple, a water cracker such as Carr’s, or a thin slice of a French baguette (fresh, not toasted). For my second taste test, I tried the “award-winning” Baby Brie. 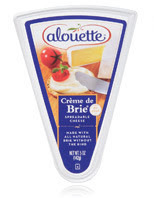 Alouette suggests that you let the Baby Brie warm to room temperature before serving, but even so, it’s a significant bit toothier than the Crème de Brie. It’ll stand up to toasted breads but also to baking recipes. So with the remaining portion of the brie, I made a pizza. Though inspired by a recent visit to Amerigo (which includes mushrooms on their brie pizza), I opted to use this brie pizza recipe that included potatoes and apples. Yes, brie AND potatoes on a pizza--because I have given up on ever being my pre-pregnancy size again. 2) I underestimated the coverage I needed. Regardless, this was one heckuva pizza. The Baby Brie melts nicely and its rich flavor stood up well to 450 degree heat and a lot of rosemary and salt. But don’t just take my word for it. Try it yourself! Or any of the Alouette products. Leave a comment for an entry (one per person, please) to win two certificates for a free Alouette product redeemable at your local grocery. I will mail the coupons to the lucky winner, so the contest is open to anyone with a U.S. address. Enter your comment before 7pm CDT next Wednesday, June 16 and I will announce the winner on Thursday. Good luck! ps--and sorry for the earworm to those of you who took French classes. I've been singing it in my head for weeks now. Posted in Product Reviews. Tags: alouette on June 10, 2010 by Lesley. Posted in Entrees, Recipes. Tags: Uncategorized on June 8, 2010 by Lesley. I’m not one to waste fresh Tennessee strawberries on something that requires them to be consumed any way but raw and mostly naked, but I got a couple of quarts that were good but not great. So I thought, “Why not try something baked?” with these berries. I wasn’t feeling ambitious enough for a cake (mmm…strawberry cake…) so I remembered getting an email with a recipe for strawberry bread in it. Couldn’t find the email, so I just poked around the internet a bit and (once again) came up with my own from the best of other recipes. Because I had a lot of strawberries to use and I really wanted a strong strawberry flavor. Preheat oven to 350F degrees. Grease and flour two 9 x 5 inch loaf pans. Combine flour, sugar, cinnamon, salt, and baking soda in large bowl and blend well with a fork. Place strawberries in a medium size bowl and blend in oil, eggs and vanilla. Add the strawberry mixture to the flour mixture, blending until dry ingredients are just moistened. Divide batter equally into pans and bake for one hour or until done (insert a toothpick; if it comes out clean, it‘s done). Let cool in pans for about 10 minutes and remove to a wire rack to cool completely. Well? This bread is MOIST. Probably too moist. And not quite strawberry-y enough for me. I suppose I should have made strawberry cake to achieve that level of strawberryness. But the bread is good. I’m thinking though that instead of pureed strawberries, a strawberry jam might be better. About 8 ounces instead of 16 (and increase the oil if the batter’s not loose enough). However, strawberry season is just about over here, so I suppose I’ll have to wait until next year to try it out. I'm also thinking some lemon in here somewhere would brighten it and add a nice tang. Hrm. Posted in Breakfast. Tags: strawberry bread on June 2, 2010 by Lesley.